This update fixes the following issues and adds the following features that were not previously documented in the Microsoft Knowledge Base. Issue 1 A smart card search takes 3.5 minutes on an idle server. Additionally, the search never ends if the server is stressed. Issue 2 The Duplicate Revocation Settings policy is replaced because some users could not set it. Issue 3 There is a redundant space in the “Profile Summary” string on the Request Complete page for some languages. Issue 1 In a metaverse search and when you view the object, there is a Last Modified field. But when you sort that field, it sorts as a generic text field instead of as a date field. Issue 2 Error messages (such as Event ID 6313) are logged in the event log. Additionally, performance counters don’t work. Issue 3 The Sync Service crashes when you run a Full Synchronization process that has Equal Precedence set for attributes that exist in IAF or EAF. Issue 4 When an incorrect page size (either less than the minimum or more than the maximum) is used for the run profile of the ECMA2 management agent, the size value quietly changes to the minimum or the maximum after you click Finish. Issue 5 An error message from the Management Agent cannot be parsed if it contains some special symbols. Therefore, the error message doesn’t appear in the error list as expected, and a non-informative error window appears. Issue 6 You receive a “Reference to undeclared entity ‘qt'” error message when you run the history process and the history text contains the “greater than” symbol (>). Issue 7 Under certain conditions, the file selection dialog box does not appear on the MA configuration wizard pages. Issue 8 A “MEMORY_ALLOCATION_FAILURE” error occurs in the Performance Monitoring tool when the performance data .dll file cannot open the process. Issue 1 Multivalued labels are displayed incorrectly in a single line in the UI. Issue 1 During an Export process between the Synchronization and FIM Service, the msidmCompositeType request may fail if some multivalued string attribute value is changed in the scope of the Export session. This behavior affects performance. Issue 2 In SharePoint Server 2013 and later versions, if you change a workflow or update an email template by using the FIM Portal, the version is automatically updated to 4.0.0.0. This causes a system error message during processing. Issue 1 When you add a user to an organizational unit (OU) that has some incompatible permissions in the OUs role, all the incompatible permissions are assigned. Issue 2 Some issues are fixed for attribute-based authorization (ABA) roles that are assigned to a user when the roles have incompatible permissions. Issue 3 When you use the Access Management Connector to provision new OUs with a parent OU, all the parent OU roles are inherited but are also disabled. Issue 4 An error occurs in BHOLD during installation in Internet Information Services (IIS) 10. Issue 5 If two or more roles assigned to a user who has the same permissions as the roles, and the roles use the endDate attribute, you cannot extract a user permission that has the latest date. Issue 6 An email alias is truncated if it is longer than 30 characters. Question already asked (a few times) on the FIM forum: how to “Query FIM user not registered for SSPR”? See Tomasz Onysko’s response on the FIM Forum thread. All of them result in a roll-back of the installation. Let me spoil the root cause right away (and then explain): using an SQL port number in the installation wizard. The installation wizard is not able to connect to the database with a port number. 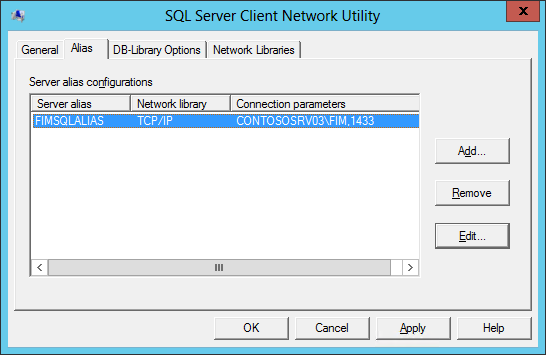 The FIM Sync Service and/or the FIM servers check the registry for the database server and instance and then connect to SQL and start the service. The use of a port number seems to break the wizard. 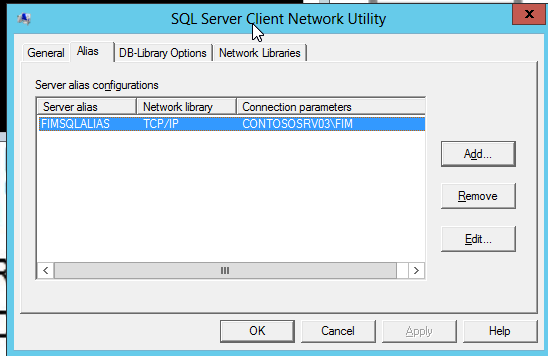 Then change the registry to use the FIM SQL ALIAS (as server), you don’t need the instance and port anymore (as the alias will take care of it). Must use hotfix 4.1.3461.0 or later KB2870703. For MIM2016 and FIM2010R2 the Connector is available as a download from the Microsoft Download Center. Many of us are using the Export-FIMConfig powershell to export, extract, migrate or document FIM Service and portal configurations. If someone complains that the localized content is not exported or migrated, I send over the links below. 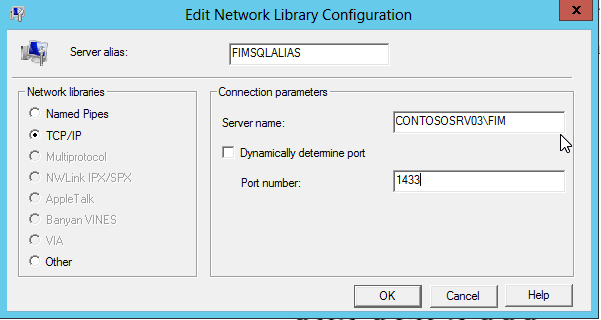 Forefront Identity Manager Configuration with Windows PowerShell. What can Export-FIMConfig do for me? Many international FIM customer have localized and/or customized content that doesn’t get exported with the default export functionality. Keep in mind that exporting the localized information and a large message size will significantly impact your export performance.